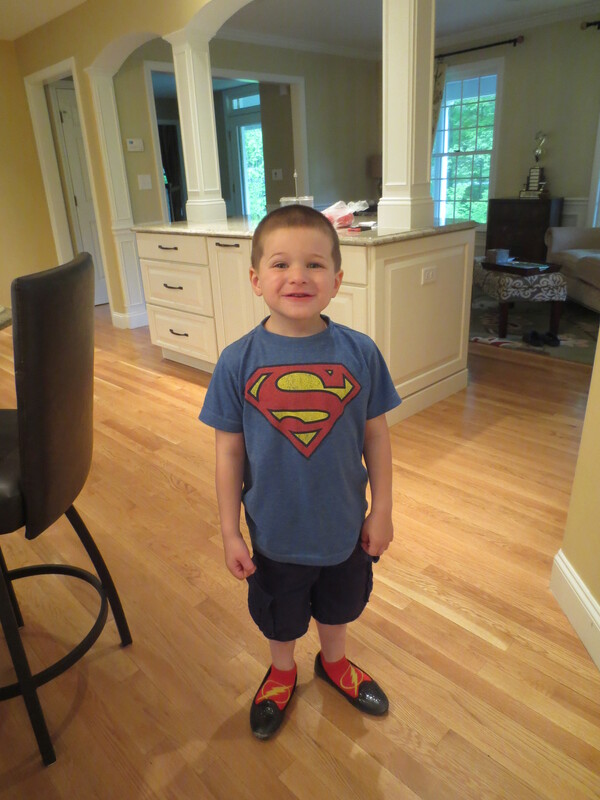 “I WEARIN’ dem!” four-year old Henry told me defiantly on Sunday, stomping a shimmery foot. He’d discovered his sister’s black “sparkle shoes” that afternoon; black ballet flats covered in silver glitter. I was trying to get him and Rose in the car to go grocery shopping, and he refused to change into his Batman sneakers for the trip. I looked down at my pink girl blankly for a moment and thought, really? This is what you’re worried about? People staring at us? I’m certainly no stranger to staring. I used to think people were gawking at me because I look uncannily like Halle Berry and I figured they were wondering what she was doing unloading a dented recycling bin from her red minivan at the dump in New Hampshire instead of frolicking on the beach in Malibu or Hawaii or wherever it is she’s always pictured in People magazine. But then I realized. It’s not because I look like Halle Berry. It’s because of my kids. We certainly don’t have the most kids or even the cutest kids. But we do have very entertaining kids, and we usually draw a few stares whenever we go out. When we ate at the hotel buffet on our trip to Buffalo, two women turned their chairs to the opposite side of their small round table just to get a better view of our family. I can’t imagine why. Jack had been obsessing about that buffet since we’d flew in the night before, and the second we walked in he raced to the stack of plates, grabbed two, and started piling on eggs and pancakes and toast, all while muttering “two minutes until it closes, two minutes until it closes,” under his breath. The boy loves a good buffet. People especially stare at us at airports. When we were trying to catch our flight home from the Disney Cruise, I saw a woman actually set her breakfast sandwich down in its greasy yellow wrapper so she could gawk as we raced by in a panic. This might have something to do with how I dressed all the kids in matching neon yellow t-shirts so we wouldn’t lose track of them. Or because Henry had decided he was a puppy and started crawling through the terminal on all fours. Barking. At least once a week people ask if the kids are all mine. I always hesitate a moment before I answer, you know, to build the suspense. And then I usually say something like, “Well, they say they are but I’m planning on getting a DNA test to make sure.” Joe and I get asked a lot of different questions, but mostly people want to know if we have any twins in the group, if our daughter is the youngest, and whether or not we’re crazy. And obviously, people stare because of Jack. Since he was a toddler pitching enormous tantrums on the floor at Walgreens to a preschooler who could repeat whole commercials to a second-grader who remembered hundreds of birthdays, people have always been interested in him. And really, it’s hard not to notice a boy who is zooming through the mall, galloping and stimming like a tornado. To tell you the truth, staring and the questions that follow the staring don’t bother me in the least. I am a big gawker myself; you might even say I am a consumer of human behavior. I love to look around when I’m out and see how people are dressed, what they’re eating, what they’re buying. If I didn’t take note of those around me, I would have no idea that low-waisted jeans are all the rage and I might still be wandering around in my Z Cavariccis from the seventh grade. It’s how we learn from each other. I much prefer staring to the opposite of staring: not staring. I think not staring leads to worse things, like muffled giggles and whispers and labels and stereotypes. Misconceptions. But when someone is staring at you, there’s a chance you can catch their eye and say, “Well, he has autism and this month he’s obsessed with avocados. That’s why he’s piled forty-two of them in the cart.” Then that person might say something like, “Oh, my niece’s son has autism, and he is a handful!” And before you know it, you and the woman in the navy blue tennis skirt at Hannaford’s are giggling over the avocado antics of a nine-year old boy and swapping recipes for guacamole. And you walk out, pushing your cart with three bags full of avocados, smiling. 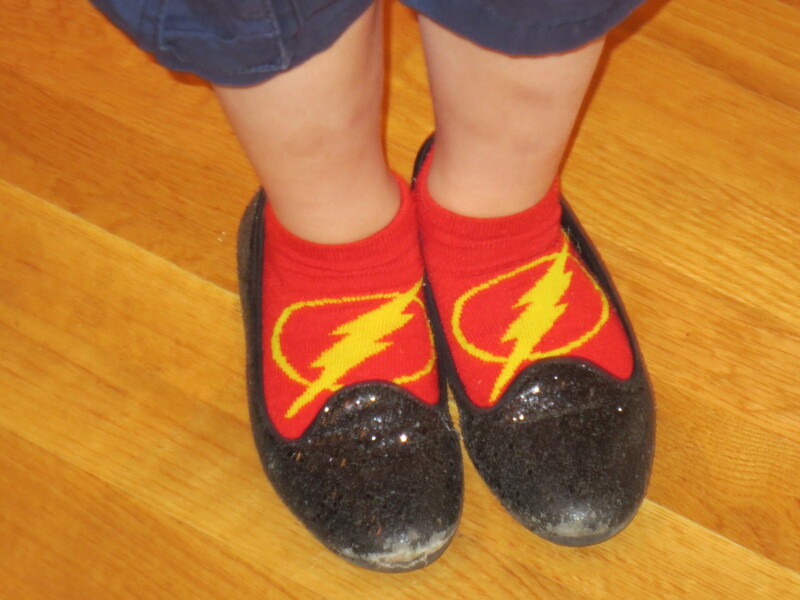 So, you can imagine my surprise that Rose was nervous we’d catch a few stares if Henry wore her shoes shopping. I wasn’t sure how to tell her that staring doesn’t bother us. That our family walks with pride regardless of how loud we are or how much we stim or what shoes we’re wearing. It seemed too big of a message to explain to a five-year old. So I said the first thing that came to mind. But little did he know that ballet shoes are hard to walk in—he couldn’t quite manage the flat sole and the bigger size. He shuffled along through Fresh Market like a glitter-clad platypus until I scooped him up and plopped him in the back of the cart, where he reclined lazily and let his sparkly footwear dangle over the sides while he ate a banana muffin. And people did stare, but I just shrugged my shoulders and smiled. I’m sure Halle would’ve done the same thing. Even Superman needs a little sparkle. This made my day. Made me laugh out loud. Thank you for that !!!!!!!!!!! Loved this blog, it reminded me of the 4 year old boy who refused to go into his gymnastics class without the pink leotard with the pink feathered collar. Gotta love and laugh at this blog. Carrie, your writings always bring a smile to my face. I hope to run into you and your family at the airport sometime. When’s the next trip??? I love this post and it sure did bring back memories – I have two daughters and two sons, (girl, boy, girl, boy) who are grown now with their own children. The girls were always dressing the boys up in their costumes, and they loved it! My youngest son’s favorite color was pink when he was around henry’s age, and he loved it when his sisters would paint his nails pink and dress him in their ballet tutus. I can remember my first reaction, which was to think – not say- is this normal, is this okay, do I stop them, do I say, only girls wear pink?? It all of a sudden seemed so silly to put that kind of judgment on the color pink and who should be allowed to wear it or enjoy it for that matter. So I thought, why wouldn’t anyone love the color pink? It is a happy and healthy color, and what could possibly be wrong with that?